Where am I on Bloom’s Taxonomy? Somewhere at the beginning of the Coetail course we read an article about Bloom’s new taxonomy. At the time I wasn’t sure I would every be able to get above the Lower Order Thinking Skills (LOTS). I was really hoping that I could just Remember and possibly Understand a few of the terms and ideas. This article was in our reading again this week. This time I was able to make more connections and look at my own learning. Remembering: I have learned and begun using Diigo. I started by creating a group for my Professional Learning Community (PLC) at my school. I will also be sharing with the staff members who are advisors/shepherds for our seniors. Personally I have also been able to bookmark articles through Diigo so I can go back and reread or look at them again. I was also grateful to learn how to organize my own bookmarked pages into folders (from the speed geeking session on September 27, I think it was during Mitch’s session). Moving up the ladder to Understanding: obviously I have learned something about blogging. Put I am pleased that this is not the only blog I am working on. After a few false starts, I have a classroom blog. I have done the posting, but last week I had the students each choose a photo and write a sentence or two about what learning was going on in the photo. Tomorrow we will be looking at what I typed (word for word) that the students wrote. The students did a great job in writing in the 3rd person and even when the photo was of themselves they were able to say he, she, the boy or the girl. We need to learn more about editing and making corrections in spelling, capitalization and punctuation, but it was a first attempt. 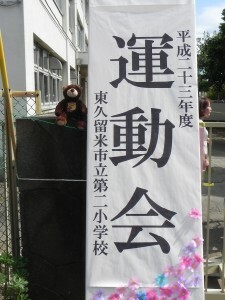 Another blogging experience that we are participating in as a class is Teddy Bears Around the World. 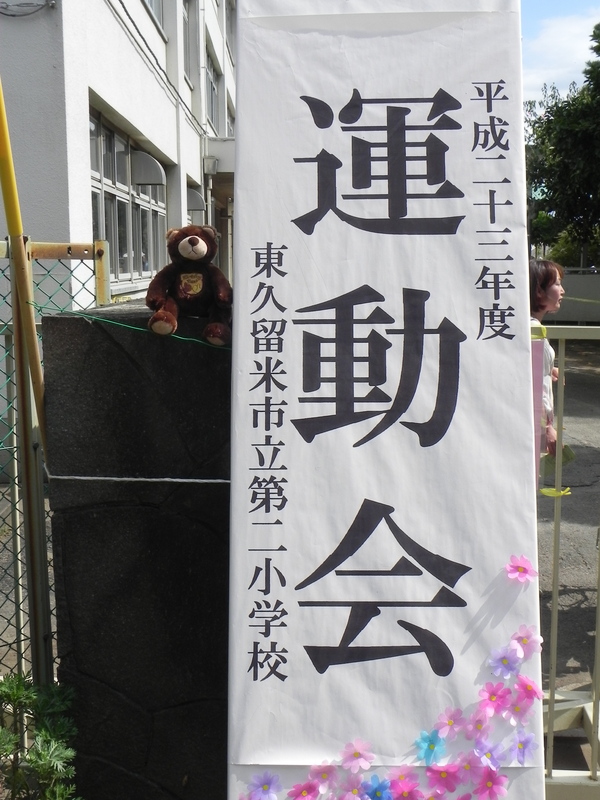 This past weekend I wanted to post something on the Teddy bear blog about Sports Day since the local elementary school was having their “undo kai” or sports day. As I picked up “Brisky Bear” our class mascot, I was wondering how strange and stalker like it might look if I went to the elementary school and started taking random photos. I didn’t take too many photos and tried not to look stalker like! In the Understanding category I have also worked on subscribing. I started with a google reader for the blogs I was reading, but that wasn’t working out very well as far as feeling user friendly. Then when I looked at the Participants blogs I felt that netvibes was much easier to navigate. Although I haven’t figured out all the widgets I am finding it much more user friendly to keep track of the blogs I’m reading at netvibes. Applying: In the last week I haven’t done any editing but I was reminded this past week of editing I did last year in iMovie. Last week my students performed a Water Cycle Poem. The performances were only 30 seconds so there really was no need for editing. After several unsuccessful attempts to upload them to the class blog, I was able to upload them to You Tube on my private channel and then share the link on my blog. My first attempts produced the photo on the blog, but when the photo was clicked, it disappeared! I asked our technology coordinator for some help and 45 minutes later the same thing was still happening. I went home and tried the You tube. Last spring I did do some editing on collaborative presentations the students had done and was able to shorten a 15+ minute retelling to about 9 minutes. I know this wasn’t great editing and more could have been edited out, but I at least learned something about the editing process. Analysing: Being able to add links and be comfortable with adding links has been a big plus in the last week. Our school is going through the re-accreditation process. I am one of the Focus group leaders. In each group we are using google docs to collaboratively write our report. This Wednesday and next Wednesday we will work on editing and adding hot links to our reports. Learning to tag blogs and what are useful tags has also come in handy with the blogging that I have been doing lately. Evaluating: As I blog more I am feeling more confident in commenting on other blogs. It has been very encouraging to receive feedback from the authors of blogs, particularly from blogs I have started following of people I don’t know. Being in this Coetail course has been a great way to collaborate and network. This week I plan on my students looking at our class blog as well as the Teddy Bear blog to discuss what are good comments, why should we comment. Hopefully, as we begin this process they will recognize the value of thoughtful comments and the greater value of a thoughtful post that will encourage people to comment on it. Creating: I haven’t reached this level yet, but I am looking forward to growing with the members in this course and with my students to reach a level where we will be directing and producing a performance of high quality and doing publishing not just on blogs but other types of publishing on the web. This entry was posted in Bloom's Taxonomy, Coetail course 1, Learning, Tech tools. Bookmark the permalink. I know the feeling. Sometimes, looking back, it’s hard to believe how far I’ve come in my understanding of the size of the changes to education that appear to be coming. It’s like there’s this big wave on the way and most people haven’t heard the weather report. I love that you have the students doing the course with us (or did you not realize you were?!). I am doing likewise with blogs and love that you have added an element of more “traditional” literacy”. I had a similar experience regarding photo-taking as well. I made a blog recording my daughter’s life (password protected) and when I took a photo of her playing with friends she made at the park my creepy radar went of a bit. I kept myself to one. I too have used many a work-around as I call them. Your blogging via YouTube fits my definition of one and I have done similarly on a number of occasions. I also love the way you used the taxonomy on yourself. I disagree with one thing you said though. You ARE creating with blog posts and YouTube as are your students. Isn’t this course great? Thanks for your comments. Sometimes it feels like 2 steps forward and 3 back. My class blog has changed so often in just 2 months and I’m still not sure we’ve had the “final” change. The students have a log in and the only way for parents to see is through their child’s login. Not exactly what I planned. And I’m not sure how to upload photo albums. I can but if I put the privacy settings on flickr can parents view them on the blog without a flickr account? There is still so much to learn! Looking forward to the new class. I was particularly struck by your reflection on evaluating that you are becoming more comfortable commenting on other blogs. It’s a big deal to find our on-line voice!